Cologne, February 2, 2018 — UL Consumer & Retail Services (CRS) is proud to announce the debut of the new UL Toy Safety Certification Mark for the European market at toy fairs around the world. The UL Toy Safety Certification Mark is a revolutionary new offering provided by UL. The Mark brings heightened credibility to the product’s safety and compliance, and provides added supply chain risk management through detailed factory quality systems audits, product inspections and testing at various points in the supply chain. This Mark enables retailers, suppliers, wholesalers and manufacturers to differentiate their product and demonstrate to their client base and to the consumer their commitment to safety and quality. The Mark helps empower trust in a complex world. The testing for the Toy Safety Certification Mark for the European market is based on EN 62115 and various EN 71 standards. To earn the UL Mark, toys are tested for several aspects including mechanical use and abuse, chemical safety and flammability. 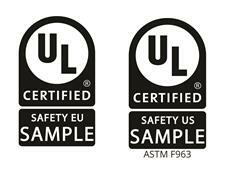 Toys destined for the U.S. market can also earn a UL Toy Safety Certification Mark, where testing is based on the latest ASTM F963 Standard Consumer Safety Specification for Toy Safety. Learn more about the Toy Safety Certification Mark. UL solves the safety, security and sustainability challenges of the 21st century. We empower trust and enable the safe adoption of innovation. To do this, UL tests, inspects, audits, certifies, validates, verifies claims, advises and trains as well as provides software solutions. Around the world, our employees share a common passion for our public mission to promote safe working and living environments for all people. Our public charity, Underwriters Laboratories, Inc., conducts independent research, community outreach, standards development and safety education.